Here is a video of our congregation during the Vigil Of The Resurrection blessing the new fire at sunset and sharing the Light Of Christ click here. Here is a video of our congregation during the Vigil Of The Resurrection making the Easter Proclamation and singing the Gloria. click here. Here is a video of our congregation during the Vigil Of The Resurrection making our Profession Of Faith and renewing our Baptismal Vows using the Apostle's Creed click here. Participate in BENEDICTION OF THE BLESSED SACRAMENT as we shared it on Holy Thursday Night, 2018. click here. Here is a panoramic view of our congregation at prayer during the Holy Communion prayers on Good Friday, 2018. click here. Here is a video of our congregation during the Vigil Of The Resurrection receiving Holy Communion. The people serve the people and we pray with every person who comes to Communion. All are welcome to receive Holy Eucharist at Ray Of Hope Church. click here. 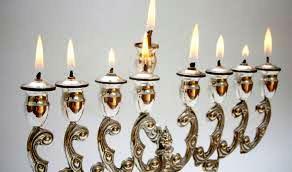 As Christians we celebrate Hanukkah. Why would a Christian church celebrate Hanukkah, isn't that Jewish? Visit our chapel and take some time for prayer. Here is a Facebook Live video showing you how to come in: CLICK HERE. Or take a short tour of the chapel here: CLICK HERE Use your back arrow to return to our web site. This is our worship videos page. Most of these are from Facebook Live events, though not all. We will be adding many videos to this as time goes on so do check back frequently. Ray Of Hope Church celebrated Kwanzaa beginning December 26, 2018 and ending on the seventh day of the celebration, January 1, 2019. All seven worship services are available for you to read here on our web site. Also, there are Facebook Live recordings of all seven linked here as well. Click here. See the entire all City Ash Wednesdy Service we participated in on March 6, 2019. We were one of the participating churches along with Bethany Lutheran Church, First United Church of Christ, Frederick Douglass AME Zion Church, New Beginnings United Methodist Church, Ray Of Hope Church, Trinity Episcopal Church, United Baptist Church , Westside United Methodist Church, and Webb Mills United Methodist Church. The Choir was directed by Helen Joy Vincent of United Baptist Church. To see the video of the worship service CLICK HERE. Below find the previous bulletins of this past Holy Week worship events, 2019. One proof that Jesus was who he said he was is the mathematical calculations written in the Bible that identify the exact days we call Palm Sunday and the Crucifixion of Jesus as they were prophesied in the Book of Daniel. Daniel saw in a vision the empires of the world up to the time of the Messiah. Daniel gave this prophecy in his telling King Nebuchadnezzar the king's dreams and giving the detailed interpretations. Daniel did this in the 6th Century B.C.. It all would begin with a prophecy for an event that would happen centuries later in 445 B.C.. If ever you were looking for scientific proof that Jesus is the Christ, here it is. Get your calculator out, or pencil and pad and do the math for yourself and see that hidden in every Bible in the world is the mathematical proof the Jesus stepped into "Holy Week" on "Palm Sunday" on a date predicted centuries before he was born. To see the proof CLICK HERE. Read the bulletin for Palm Sunday with all the readings, prayers and announcements for the week: BULLETIN CLICK HERE. Holy Thursday April 18, 2019 Worship 7PM, Exposition of the Blessed Sacrament and Adoration until 9PM, Benediction 9PM. Read the bulletin for Holy Thursday with all the reading and prayers.CLICK HERE. See the Facebook video of the service. CLICK HERE. Open the bulletin in a new window on your device.CLICK HERE. Open a secod window with the text and pictures for The Stations Of The Cross CLICK HERE. See the Facebook video of this service. CLICK HERE.